Today you can start planning your South America vacation with the cheap Bogota flights our deal hunters have found. 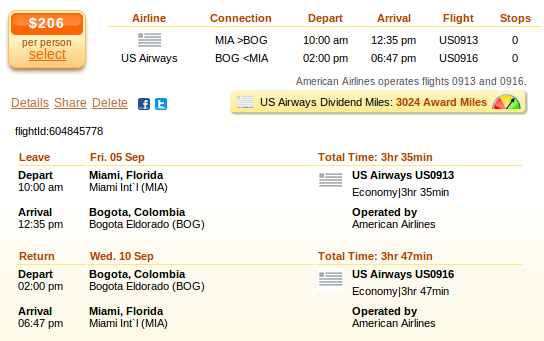 Travel to Bogota from Miami in September with US Airways and get a round-trip airline ticket for $206 including taxes. This flight deal was provided by Faregeek, but our deal hunters have found it while they have searched on Travelgrove. Look for the Bogota flight in the box and do not forget to take a look at the offers of other merchants as well – someone might have even better prices. We’ve made a screenshot to make booking easier for you. Fly out of Miami International Airport (IATA code: MIA) to El Dorado International Airport (BOG) on September 5 and return on September 10. The flight is non stop and it is operated by American Airlines each way. US Airways Dividend Miles, the company’s frequent flyer program, provides you with 3,024 award miles in case you book the airfare, which is about 8% of a free US domestic flight. US Airways is the cheapest airline for this route, you can fly with them for $206 r/t. The next best deal is a Multiple airlines flight operated jointly by American Airlines and US Airways and it costs $291 r/t, which means you can save minimum $85 compared to any other airline if you book the US Airways flight. This entry was posted on Thursday, May 22nd, 2014 at 9:21 am and is filed under Airfare Deals. You can follow any responses to this entry through the RSS 2.0 feed. You can leave a response, or trackback from your own site.